Much like any art or sport you practice, your development in the art of Capoeira will be a direct result of your consistent and dedicated training, effort, drive, and your desire to learn. No prior experience is required to begin training, you will learn everything you need while in class. We recommend training at least two times a week. This will help your muscle memory lock in and get you on a schedule. There are many class times to choose from. There is no excuse. Stay consistent! Capoeira is a holistic art with many elements; each person brings their own set of experiences, strengths and interests to class. Whatever your reason for training, remember that becoming involved in the Capoeira community by learning more about Brazilian culture, attending weekly rodas, workshops, and other special events are all a great way to better understand the beauty and strength of the art. Capoeiristas are rewarded for their dedication and growth once a year by graduating to their first (or next) cord at an event called a Batizado. Once a year, Capoeira Brasil Los Angeles hosts its International Capoeira Festival and Batizado. The festival is a week-long event where Capoeira mestres (masters), teachers, students and supporters come together for special workshops, lectures, rodas, seminars, performances, and parties! The Batizado graduation and cord ceremony is the festival’s culminating event. The annual International Festival and Batizado is the most important event all year for capoeiristas. It is what capoeiristas train for and look forward to all year. It is important not only because of the cord ceremony but also because it is an opportunity for students to train with all the visiting mestres and teachers as well as meet capoeiristas from all over the world! One month prior to the International Capoeira Festival and Batizado capoeiristas participate in their individual “ACE”: Annual Capoeira Evaluation. This is how each capoeirista’s progress is assessed. “ACE” or the Annual Capoeira Evaluation is an individual assessment of your development as a capoeirista and the progress you have made in your training over the past year. The assessment is performed by lead teachers at CBLA, and done in a group as well as individually. Capoeiristas will be considered for their next cord by being observed in their day to day training as well as their performance in their Annual Capoeira Evaluation. This is where their movement, music, participation, and in-the-roda skill is tested and individually assessed. The “ACE” process is different at each cord level. 1. You should be in CLEAN white Capoeira pants (abadas), cord, and either a Capoeira t-shirt or a white t-shirt. On Fridays and Saturdays you may wear Capoeira street pants. First time students ARE NOT required to be in uniform. First time students should wear regular athletic gear for class. 2. New students are required to purchase a Capoeira Brasil uniform within the first two months of training. 3. Proper athletic undergarments are also required for both men and women. Ladies should wear sports bras. 4. Arrive on time (or early). If you are late and class has started make sure you ask permission (from the teacher) to enter class. 5. No street shoes are allowed on the training floor. You may wear MAT shoes that are NOT worn outside. 6. Bring a water bottle. You can refill it at the water machine. You can also bring cash to purchase cold drinks in the office. 7. If for some reason you need to leave early or step out of class please let the teacher know first. White Capoeira pants are called abadas. Your abadas, cord and a Capoeira Brasil t-shirt are your official uniform. All are available at the academy and beginners can purchase an inexpensive uniform kit. For your first class wear comfortable athletic gear. 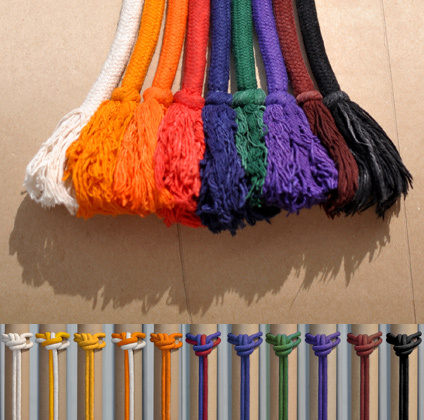 Abadas are required for Monday through Thursday class and for all special events, performances and demonstrations. On Fridays and Saturdays students can wear colored capoeira pants. Students develop differently over the years. Promotions are not based only on the amount of time a student spends in class, but also on the skill level of that student. So, two students who have trained for the same amount of time may not receive the same cord at a Batizado. This is why there are overlaps in the number of years it takes to receive a cord, the graduation process is subjective. Crua (Raw): Beginner level.Students begin their capoeira training at this level. The phrase, crua, or raw, signifies growth potential rather than being seen as inexperienced. Yellow: Students demonstrate a basic understanding of the capoeira game and have a basic knowledge of the movements, such as kicks and ground techniques, as well as music. Students know the choruses to many songs and have begun playing instruments. Orange/Raw: Transition cord to Orange. Orange: Beginner/Intermediate level. Students have a deeper understanding of the Capoeira game, utilizing many different kick, ground, and acrobatic combinations. At this level, students are also capable of leading a song during a roda and playing the instruments with increasing skill. Blue/Red: Students earn the title of Monitor at this level and begin learning how to teach kids and beginner adults. As capoeiristas, they fully incorporate a large variety of advanced movements including acrobatics, strength movements and takedowns. They have a large repertoire of songs and can play all instruments. Blue: Students at this level earn the title of Graduado. Students enter a new stage of Capoeira as they are assessed not only on their physical ability but also on their teaching, commitment to the art and their ability to communicate in their Capoeira game. Blue cords must have an excellent vision of the Capoeira game with exceptional technique, and dedicated training etiquette. A Graduado who begins teaching classes earns the title of an Instructor. Green - Instructor: At this level, capoeiristas continue to improve their skills, which now include teaching. They are very strong in the roda, and are equally strong in their instruction. Their strength comes from their ability to incorporate malicia (deviousness) and intuition into their games. It is malicia that gives capoeiristas their ability to surprise and confuse their opponents. Green cords must take their training to another level by incorporating an intellectual awareness of the art as well as strength, skill, and reflex. Purple - Professor: Capoeiristas at this level have proven themselves as skilled martial artists and proficient teachers. They are regarded highly because of their progress and devotion to Capoeira. Their malicia skill, intuition, reflex, and vision of the game continue to increase, as they now apply the knowledge they’ve gained within the roda to their dealings with the outside world, and vice-versa. Brown - Formando: Formandos are some of the most important figures in their group and in the world of Capoeira. They are the right hand of their mestres vital in the dissemination of the art form’s history, tradition, and skill as well as leaders in the group. It is their responsibility to continue their training and development in the art of Capoeira. Formidable players in the roda, Formandos can seamlessly combine all of their skills into a fierce and relentless game. Black - Mestre: This is the apex for capoeiristas. Mestres are legendary for their skills, wisdom, creativity, and tact both inside and outside the roda. They have solidified their Capoeira game by fusing their physical skill, spiritual connection to the art, and vision of the game with the cunning and trickery they’ve learned throughout their lives. Mestres comprise the top echelon of all Capoeira groups and rightfully oversee the activities of their group. Mestres are also important figures in the community, maintaining and excellent relationship with their students and other leaders in their area.